Information about Cosma Thai Pouch Saver Pack 24 x 100g - Chicken: Cosma Thai for cats is a supplementary wet cat food made from premium quality ingredients. Delicious chicken, tasty shrimps and tuna - lightly enriched with rice for a taste of the exotic. Your cat will love it. Cosma Thai supplementary cat food is made from natural ingredients and provides your cat with a species appropriate nutrition. 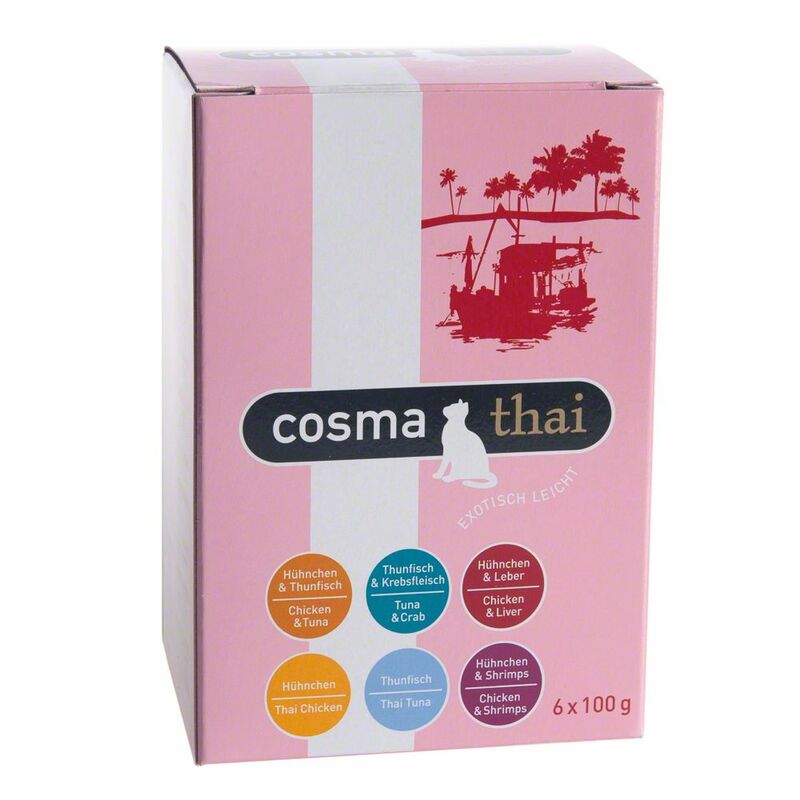 The convenient Cosma Thai pouches guarantee a fresh, aromatic taste experience at every meal in a single-portion serving. It's the perfect way to treat your cat to something very special! Cosma Thai cat food in 24 x 100g pouches is available in the following flavours: Mixed Pack: 4 pouches each of Tuna, Chicken,Chicken with Shrimps, Tuna with Crab Meat, Chicken with Tuna and Chicken with Chicken Liver Tuna: light tuna chunks in tasty jelly, lightly enriched with exotic rice Chicken: delicious chicken chunks in jelly, lightly enriched with exotic rice Chicken with Shrimps: fine chicken chunks and tasty shrimps in jelly, lightly enriched with exotic rice Tuna with Crab Meat: light tuna chunks and easy to digest crab meat in jelly, lightly enriched with exotic rice Chicken with Tuna: delicious chicken chunks and light tuna in jelly, enriched with exotic rice Chicken with Chicken Liver: great tasting chicken pieces and hearty chicken liver in jelly, enriched with exotic rice Cosma Thai Pouches - a taste of the exotic for your cat. zooplus - We sell all major brands of pet supplies at competitive prices. You might want to have a look around the zooplus website to see what other products they have. Click here to go to the zooplus homepage.